1310/1550 nm Standard model with the same wavelengths used for communication services. 1625 nm Models with a wavelength dedicated for maintenance of live fibers. wavelength in order to perform accurate measurements in live networks. wavelengths while the other port is dedicated for the maintenance wavelength. Thus this model is ideal for use in both installation and maintenance applications. 1310/1550 nm This High dynamic range model can accurately measure the trace even after the splitter in a PON system.Thus this standard wavelength model is highly suited for high port count PON networks with up to 64 ports splitters. 1310/1550, 1625 nm These tri-wavelength models offers high dynamic range and has two ports. One port offers the communication wavelengths while the other port is dedicated for the maintenance wavelength. Thus this model is ideal for use in both installation and maintenance applications. 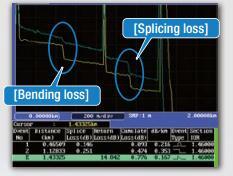 The high dynamic range feature can accurately measure the trace even after the splitter in a PON system. Thus this is highly suited for high port count PON networks with up to 64 ports splitters. In Passive Optical Network (PON) System used in FTTH (Fiber To The Home) it is important to quickly and correctly find a fault in the drop cable that is installed after the splitter. 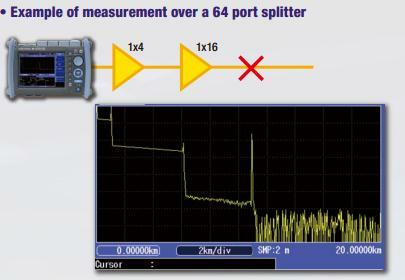 The AQ1200 MFTOTDR's PON measurement mode (*) is a mode optimized for the measurement of PON with a high-port-count optical splitter and can ensure a quality waveform even if there is a big loss of optical splitter in the line. With a short dead zone, the AQ1200 can distinguish connectors placed as closely as 0.75 m in FTTx, home or office networks. 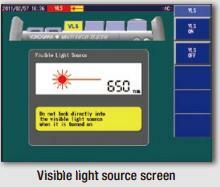 Pressing one button initiates a measurement and event search and then clearly indicates the location of a fiber break. 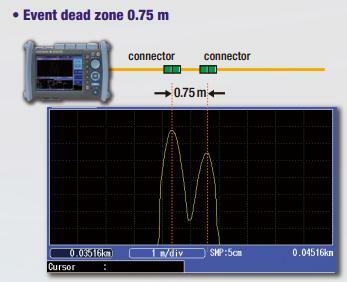 Waveform analysis can be done by simply switching over to OTDR function. After adjusting the optical output power (P1) at the end of launch fiber, measure the output power of fiber under test (P2). Allow to measure the high power output of optical amplifier, which is used for video services, such as CATV, and long distance transmission. *1 : /SLT option is required to use this function. *2 : /HLT option is required to use this function. AQ1200's light source can transmit wavelength information, so that AQ1200's optical powermeter can make measurements at a right wavelength at the other end. Moreover, the AQ1200A's light source and optical powermeter can switch between two wavelengths (1310 and 1550 nm) automatically; therefore, the optical powermeter can make measurements at right wavelengths, changing the wavelength along with the light source. Measurement results can be saved in the internal storage or external USB storage media, and the measurement report can be generated in CSV format. * : /SLT or /HLT option is required to use this function. The master unit can share the project information such as the core number table and measurement conditions with the slave unit by sending them through the communication fiber in the cable under test. The PON power meter can measure the optical power both at 1490 nm and at 1550 nm simultaneously by separating those wavelengths. Suitable tool for measuring the optical power of OLT and V-OLT. * : /PPM option is required to use this function. The visible light source enables to identify a single core out of multicore fiber and find a break point in a launch area visually. This feature works even when OTDR is in use, so that you can search for a next fiber to test, while OTDR is measuring one fiber. * : /VLS option is required to use this function. The Multi fiber measurement function automatically performs measurements and data-filing according to a pre-established file name table. At worksite, you can execute it by simply selecting a fiber number in the table. The saved waveform can be easily shown in the preview window by selecting the core number in the table. 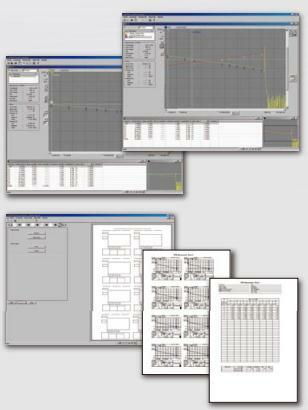 The OTDR Project File Editor included in AQ7932 Emulation Software greatly saves time to create file name table. If there is a bend in the optical fiber, the long wavelength loss is higher at the location of the bend. This function uses this characteristic to locate macro bends by measuring the same line at multiple wavelengths. The AQ1200 can be remotely controlled from a personal computer (PC) through Ethernet* or USB interface. 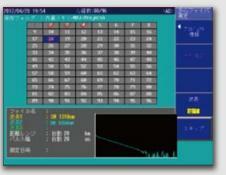 The remote control software displays a front panel image of AQ1200 on PC, so you can control the AQ1200 with mouse in the same manner as operating the actual instrument. * : /LAN option is required to use this function. 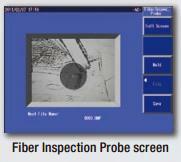 With a video fiber inspection prove connected to USB interface, the AQ1200 can show an image of the fiber end on the screen to visually inspect scratches and dirtiness. The video image can be saved in the internal memory or external USB storage media. 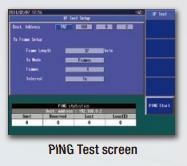 For testing network connections by sending PING through the optional LAN interface, no need to bring a PC. 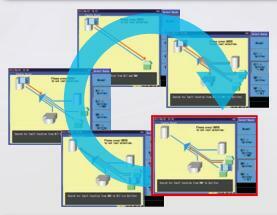 The Event Mapper is a new function which automatically detects and characterizes events in the fiber under test. In a few seconds, events are displayed on the screen as easily recognizable icons together with their data. The position in the fiber of the detected event is clearly shown in the upper part of the display. Please see here for Data Analysis and Report Creation Tool details. The AQ7932 is an application software that performs analysis of trace data measured by the AQ1200 MFT-OTDR and creates reports on a PC. The report creation wizard function makes this task simple. AQ1200 MFT-OTDR data can be easily loaded onto a PC using USB memory or storage function. You can edit event search conditions, approximate curve line secngs, and other analysis conditions, and repeat the analysis. Operation is also easy. Simply click the function icon. Display up to eight traces on screen, and perform a variety of analyses including multitrace analysis and differential trace analysis for comparing recent waveforms with old ones, and use the 2 way trace analysis function for analyzing average values of data measured from both ends of optical fiber. You can compile traces and measured values of trace files and creates a report. Reports can be created easily by just following the step-by-step instructions in the report wizard and saved in Excel or CSV format. Reduced energy, emission of CO2, NOX and SOX about 40% compared to the previous model.